Leicester is Lester, Gloucester is Gloster, Chiswick is Chizik, Warwick is Warik (unless you’re Dionne) Harwich is Haridge and Norwich is Noridge (or Naaridge if you’re from round these parts). But there is a certain consistency to the cesters, the wicks and the wiches. Not so in Norfolk – or I should say Naarfuk. Asking a Naaridge bus driver for a ticket to Costessey or Wymondham will provoke a puzzled response. You see, it’s Caassy and Windum. Confused? You will be. We’d learned our lesson in correct enunciation by the time we caught our bus to Wymondham, a pretty parish of 15,000 souls southwest of Norwich. June was bustin’ out all over the place along the 10 mile route. We arrived to find the place bathed in sunshine but spookily empty for a hot Saturday afternoon. Perhaps everyone was at Pilates. The main event was the famous abbey, founded in 1107. Well, it was famous until Henry VIII got his grubby hands on it. Once a thriving Benedictine priory, it only survived complete demolition by becoming the parish church – the monks were pensioned off and the last abbot became the local vicar. Nevertheless, and despite being half the length it once was, the twin-towered abbey church remains an imposing pile, rising majestically above the pine trees. Inside, the largely Norman-period nave has a fine wooden roof studded with carved angels. We sat in the pews awhile watching the roadies setting up for an evening concert. A plot for Midsomer Murders gathered momentarily in my mind in which an angel is pushed from the roof to squash a portly mezzo-soprano as she sings something seductive from Carmen. But whodunnit? If I ever get the commission, you’ll be the first to know but suffice it to say it involves a darts match and a ladies-only night in Cromer. I decided to call the episode ‘Revenge of the Fallen Angels’. As you can tell, I got rather carried away. Wandering round, we’d never met a friendlier or more passionate bunch of volunteers. They positively gushed with enthusiasm. Without them we wouldn’t have known about the abbey’s more eclectic secrets. 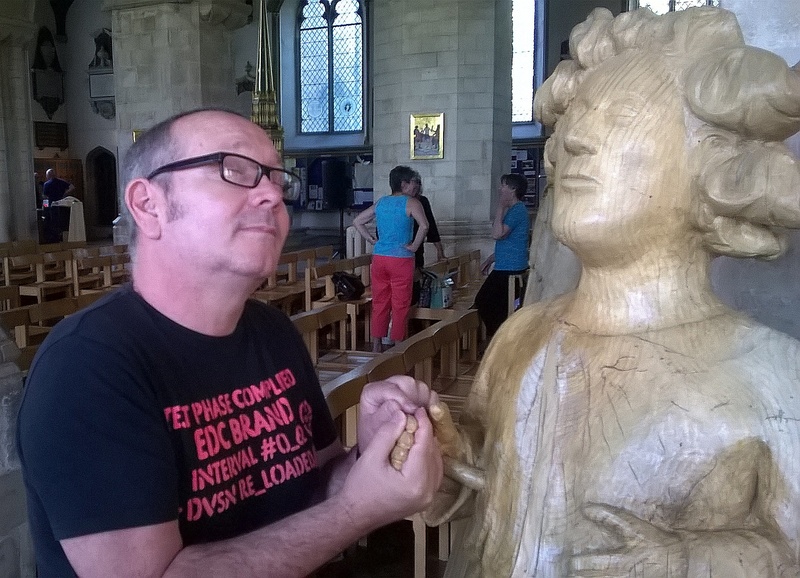 I cradled the hand of an angel to pray for world peace – and a lottery win. Liam stuck his finger in the monk’s hole and made a wish. Amen to that. We were also told about the secret tunnel that allegedly led to the nearby fourteenth century Green Dragon tavern and the ancient exit still to be found in the pub. Apparently, the naughty monks were rather fond of the Devil’s brew. It might explain all that hole filling. Naturally, we had to investigate and partake of the Devil’s brew ourselves – purely for research purposes. some rather fine pics there! I’m told that many a German parachuting fifth-columnist was exposed in my county of birth by their inability to ask directions to Trottiscliffe (pronounced ‘Trozli)! Probably the same all over the world!